This picture shows ‘Special Tank’ LMS no. 7351 in the early LMS livery with ‘LMS’ in small letters on a maroon panel. The engine was previously LNWR no. 3205 but where is it? Appears to be taken at the same location as Mystery Photo no. 10. The signals do not look like LNWR - possibly GCR? As a wild guess, how about Guide Bridge? Did the LNWR work trips there from Heaton Norris? (I'm not an expert on the NED). Who can tell us the allocation of no. 7351 in the early LMS period? There are some notes at the Archive, I believe. Picture taken at Carlisle Upperby on September 17th 1926. Possibly taken by one of the Bell brothers (Loco Publishing Co). The footbridge ran from near Hassell Street (railway houses?) on the west of the main line to a point about midway along the shed. I agree with Reg that the location is Guide Bridge, Ashton Junction. There is an extensive article on Guide Bridge in British Railways Illustrated Vol.19 no. 5 - February 2010. A photo on page 215 clearly shows the footbridge, which was there for railwaymen rather than the public. The LMS/LNWR did of course reach Guide Bridge from Denton Junction, and this is indeed doubtless a trip working. The footbridge appears to still exist, shown here. 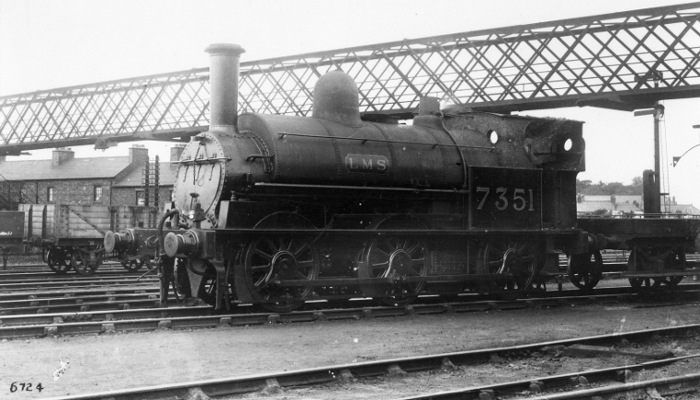 According to Baxter the engine received its LMS number 7351 in September 1926, so we can guess that the photo dates from late 1926/early 1927. The wagon behind the engine is a shunter's truck. Adding to my earlier note, the houses seen in the background are on the north side of Hassell Street, still stand and are quite recognisable today while the empty ground on the south side has recently been built on, blocking this view. The footbridge has gone, possibly when the line was electrified. I have to question John Alsop's answer, based on the signal being GCR (probably) but certainly not LNWR, and the date of September 17th 1926 which implies that the loco is only a few days out of works having received its LMS number, but it looks somewhat weathered to me. Can John point to other photos taken at this spot - in Carlisle, if his answer is correct. I have been looking at old-maps.co.uk. The trouble with the Guide Bridge theory is that the footbridge, although long, goes over a goods shed extension (editions of 1909, 1922 & 1934) and there are no houses in the vicinity on any edition, only open ground and mills. I don't think it's Upperby either - how do you account for the signal? So that leaves me completely clueless. Assuming it is a GC signal, where else did the LNWR work over the GCR? Sheffield, MSJ&A, OA&GB? Even though it is post-1923, working practices and loco utilisation changed very little until the 1930s and not much until the 1950s. I have three other Loco Pub cards taken at Upperby on the same date but unfortunately not showing the bridge. A visit to Google Earth Upperby and heading for Haslett Street in street view will reveal the terrace showing to the left. The scene also fits with period maps. The footbridge appears to have been built around 1900 - it does not feature in the Budden picture of 1898, attached, which is the same location - end of the terrace shows left. Note also the signals which look to be the same style as those in the mystery picture. Taking Philip's point I agree the engine is not in pristine condition, but would renumbering have meant a repaint or just applying transfers? The cab sheet does look smarter than the rest of no. 7351. Guide Bridge can easily be ruled out by reference to period maps which show that there were no houses in the area round that footbridge. I have to say that the old LNWR signals in the Budden photograph are not remotely like those in the mystery photograph. I would love to see another photograph which shows this bridge. I agree that it is not Guide Bridge, but the signal is definitely not LNWR but most probably GCR. I would have thought that renumbering into the LMS series would take place at a works visit, involving a complete overhaul and a repaint. There is no sign of any residual LNWR lining. I think the engine is too scruffy to have been recently out-shopped. Of course, that could mean that the date is wrong rather than the location. I have looked at the OS 25in maps of 1876, 1901 (Editions) and 1924 (revision) on old-maps.co.uk, and a better copy of the 1924 one courtesy of Kithead Trust. I think it is Upperby, specifically just north of Carlisle no. 12 Signal Box, Upperby Junction. The houses in Hasell Street fit the maps as the three at the RH end are very slightly different from those to the left, hence the roof profile and chimneys. The loco is on no. 2 Yard line (which leads to sidings 7-14 of the marshalling sidings). Behind are no. 1 Yard line, Up Third Line, Up & Down goods lines to no. 7 signal box on the NER, Up & Down Goods lines to no. 10 Bog Junction Signal Box (on the joint goods lines) Up & Down Goods lines to Crown Street Goods and beyond all those the Up & Down Main lines to Citadel station. The signals are the Down Home signals for Sorting Sidings signal box which controlled the connections in the lines to no. 7 signal box. It is stated in the Lancaster & Carliesle WTT for Feb 1914 that these lines were worked with the NER company's Permissive Block instruments. However the RCH junction diagrams show that these lines were owned by the LNWR right up to no. 7 signal box on the NER line to Newcastle. Possibly Sorting Sidings was an NER installation, which would explain the non-LNWR signals? Alternatively, they may be LNWR signals which do not "look right" when viewed from this angle. These lines were re-designated as Through Sidings between 1935 and 1937, according to the LMS Appendices and Supplements. Sorting Sidings Signal Box is shown on the 1924 map but not the 1938 one, although the signals are still shown in 1938, and I suspect it was replaced by a ground frame at this time. There was another signal box called Elevated Box which was just beyond the footbridge and out of shot to the right. I believe this controlled the points of Sorting Sidings 1 to 14, but didn't have any signals. In other words, it was really just a glorified ground frame. This is also shown in the February 1914 WTT but not in the 1931 Appendix, or any later one, so I presume it was abolished round this time. As far as I know, no photos exist of this signal box or of Sorting Sidings Signal Box. So everything in the photo seems to fit the available evidence. Upperby Loco was behind the camera. Is there any evidence of this engine being allocated to Upperby round this time? The 1898 photo in the link is taken from a point a couple of hundred yards further south, very close to no. 12 signal box. The signals are the Up Homes for that signal box, to Up Main and Up Goods. They are LNWR standard 1876 signals, as described in chapter 3 of LNWR Signalling. They were almost certainly installed in 1877 when the goods lines were opened and the area re-signalled. They would probably have been worn out and replaced by more modern ones by 1920. Regarding painting at Crewe Works, after the initial enthusiasm for repainting engines in LMS colours, the situation changed drastically due to the onset of severe recession and the need to reduce costs, and then due to the re-organisation of Crewe Works. The Scott-Walsh papers in Stockport Library contain the following notes in letters from S.S. Scott to A.St.G. Walsh, May 2nd 1924: "The paint shop at Crewe has been cleared out and closed for the present." July 24th 1924: "Nothing is being done at Crewe in the way of painting or re-numbering. The economy stunt is in full blast, and they have gone on short time." August 21st 1924: "Some of the latest re-numbering has been done at various places, none at Crewe, but Bow, Derby, Stoke and Barrow have all altered old LNWR stock numbers." Many LNWR engines remained un-renumbered, and it was not until late 1928 that an effort was made to renumber all those engines still carrying LNWR numbers, so it seems almost certain that no. 7351 was not renumbered at Crewe - possibly in the works at Carlisle?. From the photo it looks as if only the cab side-sheet has been repainted and the number applied, and the 'LMS' panel applied to the tank side. As regards the allocation, in a printed list of LNWR-LMS renumbering, to which has been added, in hand-writing, details of engine, class and allocation, dated "approx end of 1926" by G.H. Platt, no. 7351 is given as allocated to 'CS'. What that means I am not sure. In the LMS block allocations for tank engines issued on February 22nd 1928 it is shown as 'Nuneaton'. Further to Ted's note on no. 7351, perhaps I can add a few further observations which may be of interest, even though it offers no answer to the original query. Although the engine may appear to be scruffy - the LMS transfer looks new. The area round the smokebox and chimney appears clean - and so I would suggest the engine is likely to have recently received a repair (wheels, frames and rods appear clean and bright - brake blocks appear new). When researching Coal Tanks, photo evidence coupled with Crewe works information indicates that engines could be fully repainted following a light repair, but conversely turned out 'scruffy' following a heavy repair. Perhaps they couldn't afford time out of traffic to have a heavy repair and a full repaint at the same shopping. As Ted has mentioned, the repair could have been undertaken at Carlisle - and so a repaint there would be most unlikely. Renumbering appears to have been done where and whenever was convenient/appropriate. To offer one possible answer to Ted's query re the meaning of CS, perhaps this could be 'Crewe Stock'. One of the Williams' notebooks at the NRM which records allocations of what appear to be engines leaving the works and their destination during 1916 gives the destination of one Coal Tank (I only extracted that info!) as Stock. Somewhere at Crewe was the Stock Shed, which is occasionally recorded in pages of Railway Observer. Can anyone identify its location? Very clearly Carlisle Upperby under the footbridge to the loco shed, Hasell Terrace on left.